"The Jews - An Italian Story. The First Thousand Years." 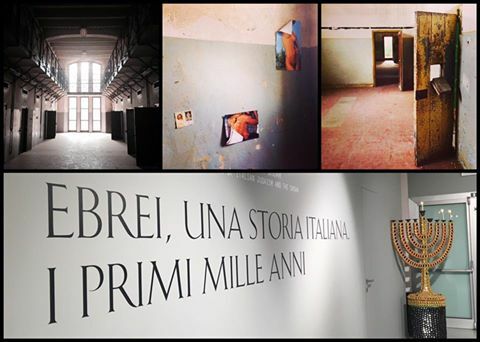 Exhibit at the National Museum of Italian Judaism and the Shoah (MEIS), Via Piangipane, 81, Ferrara, through 16 September 2018 (admission and hours). The exhibit "Jews - An Italian Story. The First Thousand Years" at Italy's National Museum of Italian Judaism and the Shoah (MEIS) through 16 September 2018 displays over two hundred Roman and Medieval-era artifacts from areas of Italy in which Jews are known to have lived, worked, and worshipped within broader societal contexts from the densely urban to the sparsely rural within the time frame of the second century BCE through the eleventh century CE. Much ground is covered, both chronologically and geographically, and only the exceptional occasion of the MEIS's provisional inauguration in late 2017 (the museum is not scheduled to be fully operational before 2020) could put the Italian bureaucratic universe in perfect alignment to make possible this event. Wishing that the collection could stay together like this forever is useless: most of the exhibit material will soon be repatriated to different museums and archives in Italy and abroad, so much of the collection is that rare or unique. True, it is not the first show for a number of pieces that visitors might recall from other exhibitions, some Jewish-themed, others with a broader focus on ancient religion or Rome. The MEIS show, however, is different on a number of counts. As "An Italian Story", the show puts welcome emphasis on Southern Italian sites, hardly a day trip from the country's tourist meccas (the MEIS's location in Ferrara, on the other hand, is easily reached from transportation hubs Bologna and Venice). In addition, it juxtaposes familiar stories and sources - the Roman destruction of the Temple as celebrated on the Arch of Titus reliefs, the Rome and Ostia epigraphs with Jewish motifs and terminology, the venerable writings of the Cairo Genizah (fragments of piyyettanim) and illuminated manuscript copies of Josephus and the enigmatic Collatio, with artifacts rarely on public display or in fact only recently discovered. With the exception of some non-Jewish propaganda, like a statue of Titus, coins marking Judea's defeat and subjugation, Hellenistic-style kitsch in the form of a pygmy-style Solomonic scene from Pompeii, and original texts of anti-Jewish decrees or simply administrative concerns (like the Diploma of Berengar I of 905, making mention of Jewish merchants in medieval Verona), along with a tiny number of objects which reflect Christian appropriation of Jewish Scripture (including a gold glass with a Mosaic scene, and a personification of "Synagoga") the artifacts selected for display or shown in careful reproduction, like wall paintings from underground funerary chambers in Rome and Venosa and mosaic panels from a building in Bova Marina in Calabria, do not always contain explicitly "Jewish" motifs, but relate nonetheless to the title theme of Jewish practices and beliefs being interpreted and perpetuated in Italy over a long time and in distinctly "Italian" ways as regards other lands of Jewish Diaspora - even during the centuries once known as the "Dark Ages". In terms of quantity, the bulk of the ancient artifacts with some sort of recognizably Jewish content comes from Rome (more specifically, from cemeteries in Rome used by Jews), but the number of finds from other sites is slowly increasing, maybe by handfuls, and not always in original context, but it is enough, often, to understand a Jewish investment in maintaining certain practices and religious rites over time. Here, in fact, faced with dozens of examples of epitaphs (close to fifty in all), and over a hundred small finds, such as seals, stamp impressions, amulets, and especially clay lamps (recently cataloged), the diversity among representations of classic Jewish motifs, especially the menorah, are vivid, and suggest anything but staticity in Jewish art, that to non-Jews might have seemed particular, yes, but not so very peculiar. The last halls of the exhibit display primarily manuscripts - over twenty - and eighteen original documents, many in Hebrew, dating no earlier than the beginning of the Medieval period, as Hebrew texts do not survive before that date in Italy, with the exception of a few lines of text on some epitaphs, seals, and amulets, even one or two apparently Samaritan-themed invocations. Here, too, the emphasis is on Rome and south Italy, on Roman, Byzantine, Lombard, and Saracen territories where Judaism was a cultural and intellectual force with study centers of Hebrew instruction and writing (for example, Oria, Otranto, and Brindisi) though sites north of Rome are not excluded (for reference is made to population centers like Lucca, Pisa, Ravenna, and Verona). The guide par excellence to the diffusion of Jewish culture in many areas of the Italian coastline and south is the twelfth-century Spanish traveler, Benjamin of Tudela, who sought out Jewish families throughout Italy while en route to the Holy Land. Quotes from his "Travel Blog" of sorts are illuminating for their testimony of families, professions, and local histories that are deeply rooted not just in the Bible and Jewish folklore, but also in shared cultural traditions reaching back to Ancient Rome. Other texts in the collection, however, are more explicit about a new, wretched period of Diaspora in formation, characterized by the Crusades, the Inquisition, and many forced conversions and migrations. This period of oppression does not break up Italian Jewish culture entirely, but shifts its centers of activity, leaving Italy's Southern Jewish communities largely silent until very recent times. "The Jews - an Italian Story" tries to explain why their story matters in the overall history of Italian Jews - and amply demonstrates their contributions to Italy's cultural and intellectual traditions, notably in science, music, and medicine, even the time-honored practice of magic - well beyond the scope of Jewish observances. The exhibit is in Building C of the old prison of Ferrara, one of five structures that will form the MEIS. The challenge of showing "things" that are not necessarily art - the kinds of objects that an ordinary visitor might pass over in a typical museum display - is met by grouping artifacts in terms of chronology and geography, and by providing virtual guides - that is, projections of scholars of international repute who introduce each exhibit hall in Italian with English subtitles. Many of these exhibit commentators have also contributed to the catalogue, edited by curators Anna Foa, Giancarlo Lacerenza and Daniele Jalla and published in Italian and English by Mondadori Electa (2017). Even with the show's closure in a few weeks, this volume, with hundreds of illustrations will enjoy long use as a guide to Jewish artifacts in so many corners of Italy - a task the show's curators have admirably succeeded in doing to emphasize the MEIS's relevance to Italy, and Italy's necessary role in the MEIS.